A double Iridium flare has been captured against the stars of Perseus in this image by Chris Newsome taken on the 24th August 2006. The flares occurred 7 minutes apart. The dimmer one (magnitude -1) is Iridium 29 and appeared at 22:47 while the brighter (magnitude -6) is Iridium 90 and appeared at 22:54. The telescope/camera setup was pointed at 50 degrees 33' 33" declination and 3hr 8m 1.14 seconds RA. 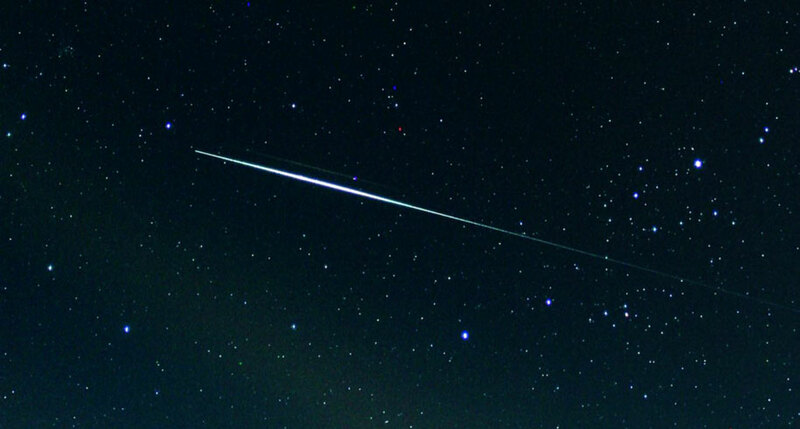 The star that was 'skewered' by Iridium 90 is Mirphak in Perseus. The image comprises four 5 minute exposures at 100 ASA taken with a Canon 300D camera set at 55mm and f/5.6. The camera was piggybacked on a Skywatcher 80T refractor which was doing the autoguiding via a Meade DSI camera and a GPUSB interface controlled by MaximDL. This setup was in turn was piggybacked on a Celestron C8-NGT. The four images were calibrated with darks in MaximDL and then layered in CS2 using a softlight overlay to try and retain both flares in the flattened image which was then adjusted using curves and levels. 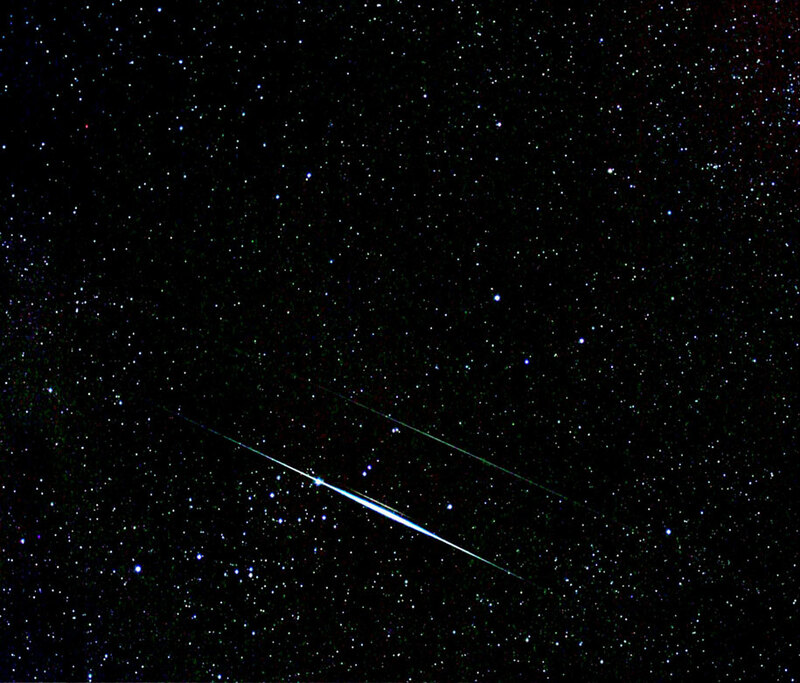 Chris Newsome took the following picture of a flare from Iridium 31 against the stars of Perseus on the 21st August 2006. The satellite flared at 37 degrees azimuth and 24 degrees altitude (RA 3hr 56m 36sec , Declination +50d 41m 44s) glowing at a magnitude of -7 mag at 22:56 BST. The bright stars to the right edge of the frame are Mirphak and the Perseus OB-3 stellar association. The image was taken with a Canon EOS 300D camera piggybacked on a Skywatcher 80T telescope which was in turn piggybacked on a Celestron C8-NGT - which Chris describes as a "very top heavy setup"! The scope was guided with a Meade DSI camera through the Skywatcher 80T using a GPUSB guide interface and controlled with MaximDL. The focal length of the lens was set at 55mm f/5.6 and a CLS filter was employed to reduce the heavy sodium light pollution. The image is processed from four 120 second frames at 400 ASA which, surprisingly, were NOT combined in MaximDL. Instead Chris layered the four images in CS2 and used a 'colour enhance' overlay to merge them, before flattening the four layer sandwich into one. The resulting image was then processed using RGB levels and curves, also adding an adjustment on the red level to reduce a bit of the skyglow. 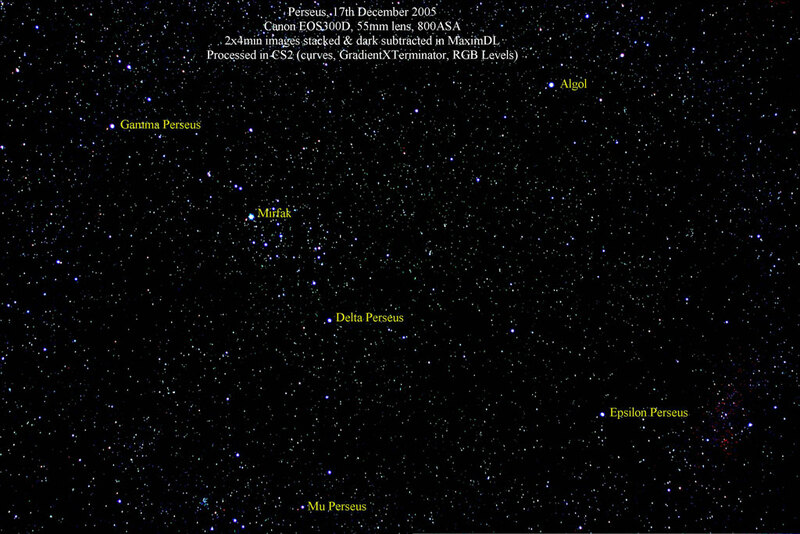 This picture of Perseus was taken by Chris Newsome on the 17th December 2005. Exposure details are given on the image and the brighter stars are identified.